Nutritional data per 2- slice serving. Prepared using part skim mozzarella cheese. Preheat oven to 425 degrees F. Lightly grease jelly roll pan, 15 1/2 x 10 1/2 x 1- inch, or a cookie sheet. Mix baking mix and water until soft dough forms; beat vigorously 20 strokes. Gently smooth dough into ball on floured board. Knead 20 times. Pat dough in bottom and up sides of pan with floured hands. Or roll into a rectangle, 13 x 10- inches and place on cookie sheet; pinch edges of rectangle, forming 3/4- inch rim. Spread marinara sauce over dough. Scatter mozzarella cheese over sauce. 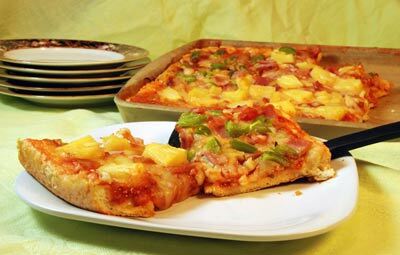 Scatter ham, green pepper and pineapple over cheese. Sprinkle with parmesan cheese. Bake until crust is golden brown; about 20 minutes. Slice and serve.